How are you doing on your New Year’s resolutions? Hopefully you aren’t part of the 80% of Americans who discard their resolutions by February, (1) but if you are, remember that there’s nothing magical about January 1st. No matter where we are in the year, you can set new intentions and make the small steps necessary to make your goals a reality. If you have dreams of turning your finances around or setting a firm financial foundation, here are some actionable steps to jumpstart your financial plan in 2018! Don’t let your past mistakes keep you from moving forward. Did you make some bad investments or neglect to save? Start fresh from today and leave the past in the past. Take a look at your current financial situation, including income, savings, debt, and expenses, then come up with practical goals to make your dreams a reality. Don’t be afraid to dream big financially. What if you could save an extra $100,000 in the next five years or become financially independent years before the average retirement age? Having a big goal in mind can inspire you to stay on track. To avoid getting frustrated along the way, celebrate small milestones, such as reaching $5,000, $10,000, $25,000, and so on. Reevaluate your goals frequently to ensure you’re on track and make adjustments as needed. Having a goal in front of you will give you perspective in your day-to-day decisions and help you prioritize your saving and spending. Securing your financial future isn’t just about saving and investing, but also about managing your risks. Insurance helps you protect against risks that could ruin you financially. Your insurance needs will change based on your age, employment status, marital status, number of dependent children, etc. It is important to review your coverage each year to make sure you are fully covered and also to ensure you are not spending money on insurance that you don’t need. Double check your named beneficiaries as well to make sure they still reflect your preferences. If you are excited about conquering your goals, one of the first steps you need to take is to eliminate debt. When you are paying 10-30% interest on any number of credit cards or loans, you are cutting down on the money you have available to put towards your goals. Become relentless about reducing your debt and interest costs and consolidate accounts where you can. If you have a loan with a significantly higher interest rate than the others, you may want to work on paying off that one first. Or, if you’re feeling overwhelmed by debt, try paying off the loan with the smallest balance first, no matter the interest rate, in order to gain some momentum. Anyone can close their eyes and pick a random mix of mutual funds to invest in, but having a customized retirement plan based on your circumstances, goals, and risk level is what will get you from point A to point B. Asset allocation is the most critical investment decision you can make. Sit down with a financial professional and create an investment philosophy that will give your portfolio a clear sense of purpose. No matter how hard you work to create a foolproof financial plan, there will always be risks and roadblocks that have the potential to get you off course. Inflation will decrease your purchasing power and rising healthcare costs can eat away at your nest egg. Unexpected early retirement could change the timeframe of your goals, tax changes could throw a wrench into your planning, and the loss of a spouse could impact your standard of living. Speak with your advisor to find ways to protect yourself against these risks. 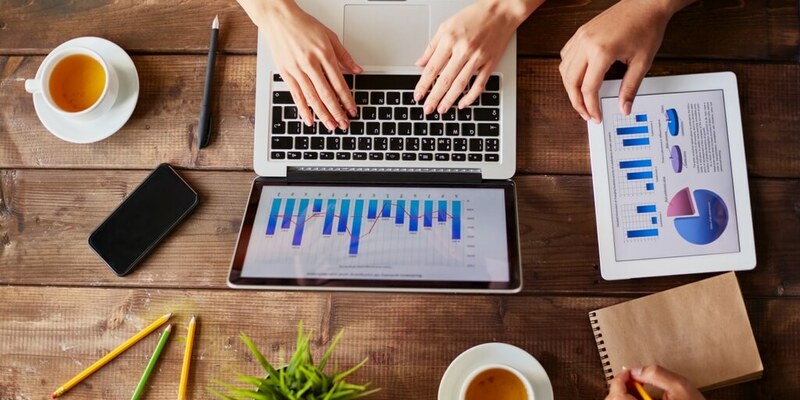 Whatever your situation, whatever your goals, a financial professional can walk you through each of these steps to get your financial plan in shape. Have you created a financial plan? If not, what has stopped you from creating one? At Balboa Wealth Partners, our advisors specialize in overseeing your financial affairs and coordinating the day-to-day execution of your long-term financial plan, all with high-touch, responsive service. Let us help you jumpstart your financial plan in 2018 by contacting me at 949-445-1465 or jgilbert@balboawealth.com. https://balboawealth.com/wp-content/uploads/2018/02/jumpstart2018.jpg 512 1024 Jeff Gilbert https://balboawealth.com/wp-content/uploads/2017/03/logo.png Jeff Gilbert2018-02-15 15:44:282018-06-05 10:40:56Jumpstart Your Financial Plan for 2018! The markets took a big dip on Monday, with the DOW losing 1,500 points for the first time in a single day and the S&P 500 down more than 4%. The CBOE Volatility Index, which measures fear in the market, saw its biggest one day increase in history. Many investors, especially those close to retirement, are nervous. 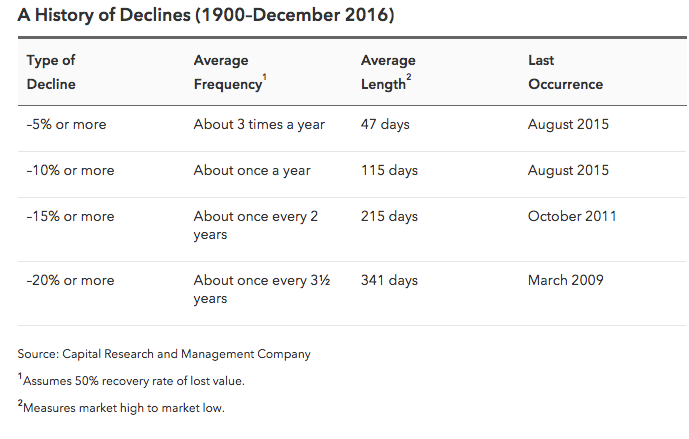 But what should you do during a market decline? At times like these, it’s important to put current conditions into perspective. This is not the first time the market has taken a tumble and it won’t be the last. Declines in the Dow Jones Industrial Average are actually fairly regular events. In fact, drops of 10% or more happen about once a year on average. There’s an old saying that the best thing to do when you meet a bear market is the same as if you were to meet a bear in the woods: play dead. While easier said than done, successful long-term investors know that it’s important to stay calm during a market correction. Market volatility has increased in recent years and the media can often make it seem like each episode is worse than the one before. In reality, volatility does not hurt investors, but selling when the market is down will lock in losses. We understand that volatility and market declines are stressful. However, we encourage you to keep in mind that while the stock market may be down significantly, your portfolio is made up of both stocks, bonds, and other assets that are designed to work together to decrease overall losses. It’s important to consider your specific portfolio, investment horizon, and circumstances when reflecting on economic events. If you have questions about your portfolio, get in touch with our office. Whether you’re new to investing or an experienced investor, it’s helpful to consult with an objective third-party. Human nature causes us all to act out of emotion when our accounts go down. As an independent firm, we put your best interests first. We seek to serve as a support system for our clients, helping them make informed financial decisions that aren’t driven solely by emotion. If you have friends or family who need help with their investments, we are happy to offer a complimentary portfolio review and recommendations. We can discuss what is appropriate for their immediate needs and long-term objectives. Sometimes, simply speaking with a financial advisor may help investors feel more confident and less concerned with the day-to-day market activity. https://balboawealth.com/wp-content/uploads/2018/02/StockMarket.png 512 1024 Jeff Gilbert https://balboawealth.com/wp-content/uploads/2017/03/logo.png Jeff Gilbert2018-02-05 14:53:102018-06-18 11:09:31What Should You Do During a Stock Market Decline?